What are working cracks? Working cracks are horizontal and/or vertical movements in cracks greater than 0.1 inches. An example of working cracks is a transverse crack. Understanding crack sealants Crack sealants are rubberized and have the ability to seal the crack while staying flexible with the pavement’s movement. Beneficial for active cracks that continue to extend in size and severity over time, crack sealants stop water and debris from entering the crack, protecting the longevity of the pavement. 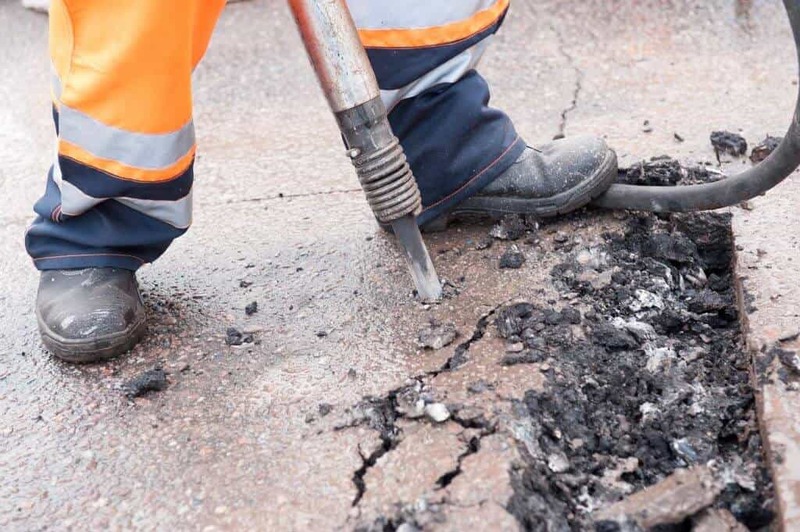 Crack filling Crack filling is the placement of asphalt emulsion into non-working cracks to reduce water infiltration and to reinforce the adjacent pavement. What are non-working cracks? Non-working cracks are horizontal and/or vertical movements in the crack less than 0.1 inches. Examples of non-working cracks include longitudinal, diagonal and alligator cracks. In contrast to crack sealing, crack filling treats pavement that doesn’t show significant movement. 1. TRANSVERSE CRACKS The crack extends in a perpendicular fashion to the centerline or laydown direction of the pavement. Cause: thermal shifts and are the first to appear. 2. LONGITUDIAL CRACKS Longitudinal cracks run parallel to the centerline or laydown direction of the pavement and appear later than transverse cracks. Cause: Poor lane join construction, pavement shrinkage, hardening of the asphalt and shifts in temperature. 3. EDGE CRACKS Edge cracks develop between the edge of the pavement and concrete curbs. Cause: Seasonal thaw cycles that result in widening and deepening of the crack. 5. BLOCK CRACKS Block cracks develop in square pieces and are spaced between 4 to 12 feet. They often appear at the end of the pavement life. Cause: improper construction of base courses or lack of drainage. 6. REFLECTIVE CRACKS Cause: Changes in the movement of the sub-base, causing the surface material to crack. Correcting sub-base courses can help eliminate reflective cracks. 7. ALLIGATOR CRACKING Alligator cracking is a series of interconnecting cracks that are extensive, close together and resemble an alligator’s skin. Cause: Deterioration in the asphalt from repeated traffic loading. When deciding whether to fill or seal a crack, the best option is to speak to a professional. They will carefully evaluate the type of crack, expected movement of the pavement and whether it is a working or non-working crack. Transverse cracks are usually the first to appear in pavement surfaces, but other types of cracks can develop at the same time. – Crack filling: Often the best option for non-working cracks with moderate to no edge deterioration. – Crack sealing: Often best option for cracks with limited edge deterioration.